Now that the importance of the battery and how long they last is available for reading. How can the age of a battery be determined? There are a few methods to identifying the age of a battery. Some of the common methods used by the different two-way radio battery manufacturers/providers will be explained. This will help in knowing the age of the battery found on the user’s radio. Every battery manufacturer, provider, or reseller provides a method of identifying when the battery was built and/or sold. 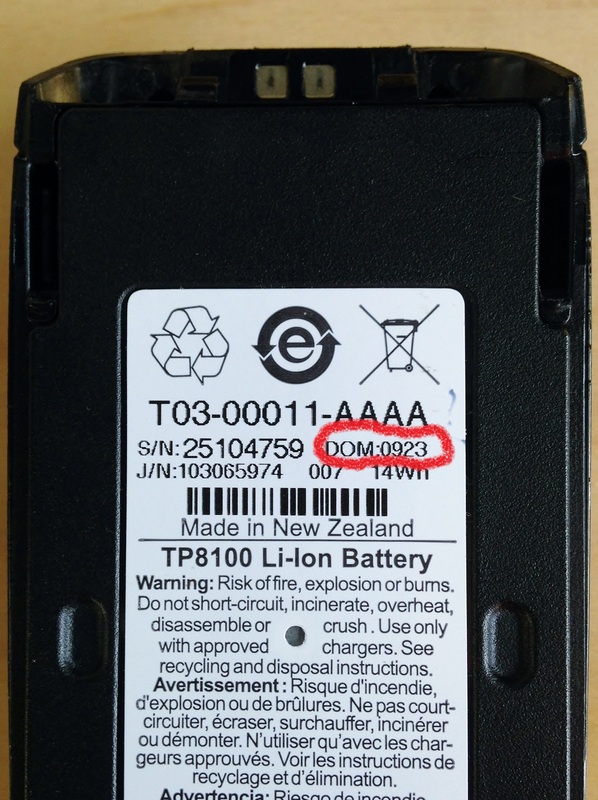 When a battery is shipped to a warehouse, before distributing to the end user, a code is imprinted. Each manufacturer has their own style. Most follow some basic guide lines by noting the age of the battery. It is not the guide lines but the format used that differs from vendor to vendor. Each battery provider starts with the year of manufacture followed by the week of the production run. It is during this labeling process that the fun begins. I will provide a picture and explanation of the most common formats used in identifying the age of a battery. I will start with Motorola and Tait branded batteries. Motorola and Tait use a format where the year of manufacture is followed by the week of manufacture. Ie: 742 = (7) 2007 (42) 42nd week of the year noted. 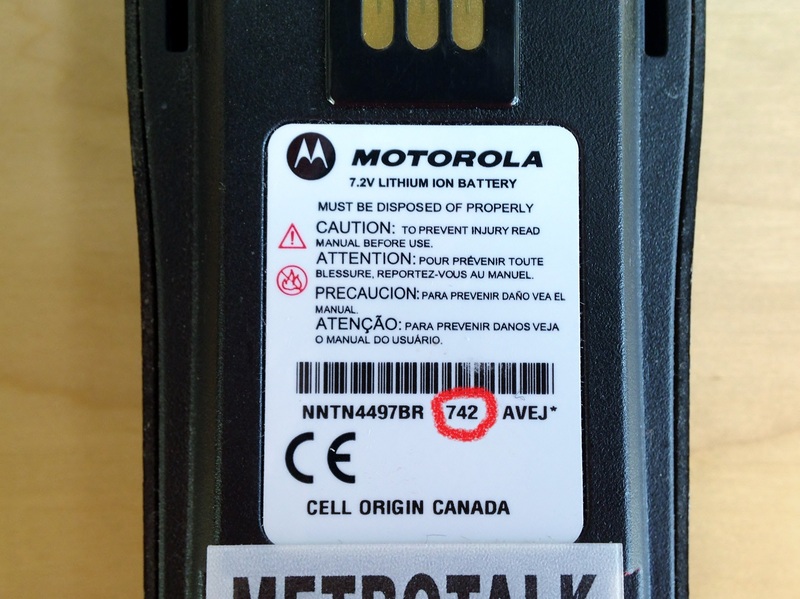 Thus a battery from Motorola or Tait with this date code means that it was manufactured on the 42nd week of 2007 or October of 2007. Tait provides a user friendly acronym DOM before the date which stands for Date Of Manufacture. On the Tait battery the DOM: 0923 represents year 2009, 23rd week. The only drawback is that the exact date is not possible, so you would have to look at your invoice if it happens that your battery fails within the One year warranty. 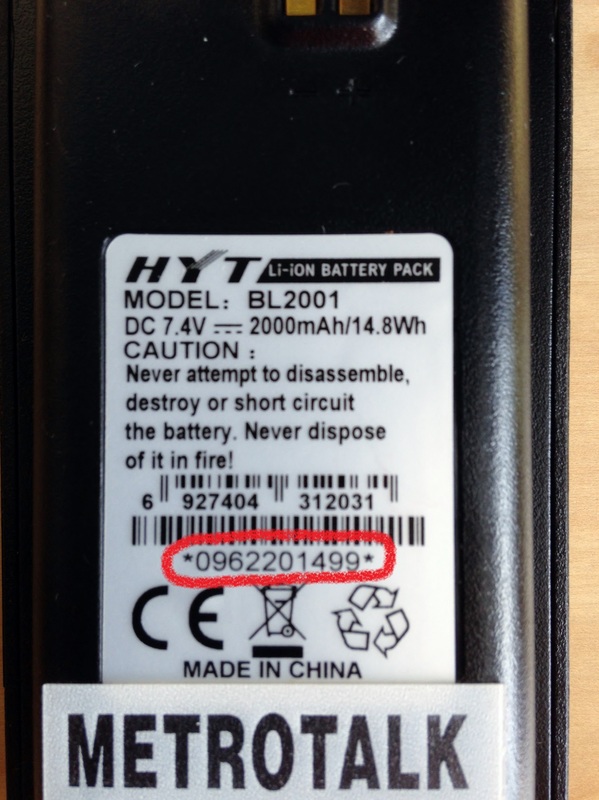 The HYT/Hytera batteries are assigned a serial number. This serial number starts with the year listed in numerical form followed by a set of numbers. The numbers following the year also represent the week and additional information of manufacture, along with information used by the factory as a means to track production and quality control. We now switch to the Vertex Standard battery. Here it’s where it gets fun. 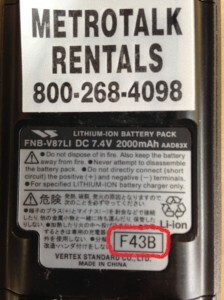 Vertex Standard decided to follow a non traditional method of noting the age of a battery. They do not use a numerical digit, but a letter from the alphabet, to identify the year of manufacture. 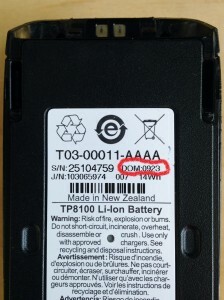 In our example, the F43B on the lower right corner of the battery label identifies this battery as having been built in 2006. The year 2001 started with the letter (A) so the (F) in front of the 43 represents the year while the (43) still represents the week of manufacture. The (B), I believe, represents the shift at the factory that built the battery . 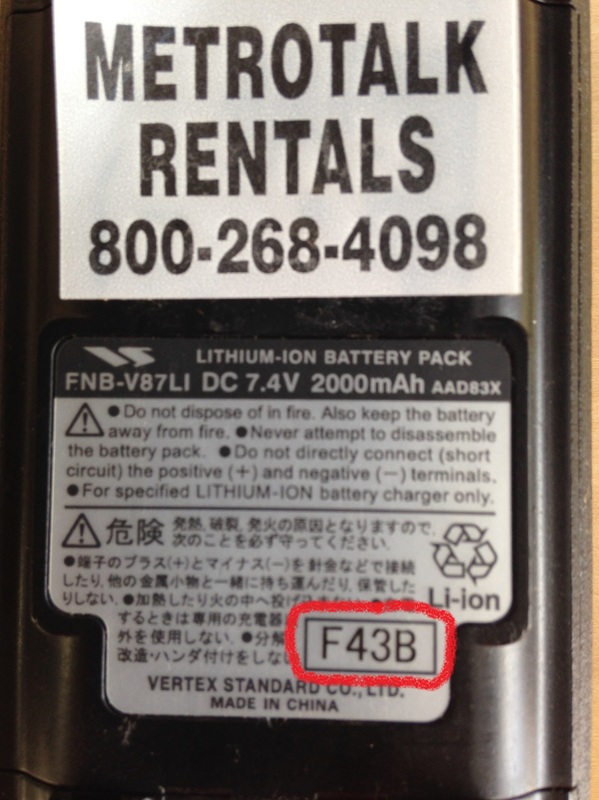 I have only seen A,B, or C used at the end of the Vertex Standard batteries. I could be wrong. Due to these differences in identifying the age of a battery we, at Metrotalk Inc., decided to use a different label style to easily identify the age of batteries sold by us. We started using a label that listed the first letter of the month in two rows. Starting with the (J) for January and ending with the (D) for December followed by a number to represent the year. We would notch the month and year when we delivered a battery to our client. This notch was not very easy to see and if the month side of the label had multiple cuts, due to use or tampering, it was impossible to identify the month of sale without finding a copy of the invoice. We then switched to a variation of the Motorola/ Tait format but made it a little bit more user friendly. We started adding the month followed by the year on the bottom portion of the label to identify when the battery was sold. In the included example, the 02-2013 represents the Month of February (02) followed by the year (2013). This was accepted with relief by our clients since it was the easiest method, so far, of our customers knowing when they purchased the battery . Unfortunately, some customers still had problems with our method of identifying the age of the battery. Their complaint was whether the numbers identified the date the battery was purchased or the date the warranty expired. Using the previous example: 02-2013, many customers understood the number to mean the battery warranty ended on 02-2013 or February 2013. 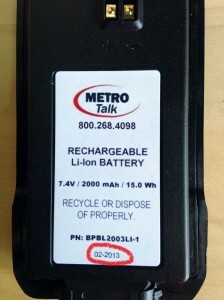 After listening to our clients and determining what could be done to make the label self explanatory, we decide to use our present format to identify the age of a battery sold by Metrotalk Inc.
We now list on our battery label when the battery was sold and when the warranty ends. This format change has been received with approval from all our customers. It provides all the information they need to identify when the battery was purchased, how old the battery is and the exact date the battery goes out of warranty. Now, there is no question whether the battery on your two-way radio is or is not under warranty.